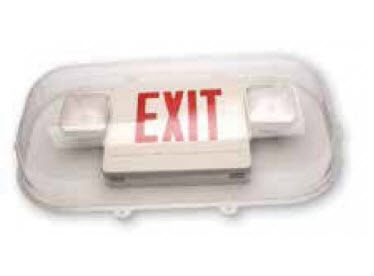 Vandal resistant guard for combo exit signs can stand up to abusive environments protecting your emergency lighting or any fixture that will fit within the vandal guard. Great for schools or gymnasiums where there is a lot of activity, and the potential for damage is greater. The polycarbonate construction is unbreakable and in a strong bubble shape which can withstand almost any abuse. - Protects your exit lighting investment.